Being born and brought up in Nagaland's Dimapur, every time I hear somebody talking about the Northeast of India, it drives me back to nostalgia - a tiny town with basic facilities, limited infrastructure, an easy life without any breathing issues and most importantly a community where everyone is a known face – a happy face. And when it comes to its music, I can vouch for its anything but forceful attitude. I grew up watching the young northeast prodigies jamming on the terraces. The sheer spontaneity of musical expression in Northeast has been a constant attraction for the rest of India. Why I am repeating this familiar story? Because now I live in New Delhi and the dusty, noisy by-lanes of busy South Delhi has become a part of my identity. Make no mistake, I love it; however, once in a while when I do get to relive whatever "North-east culture" the other metropolitan cities decide to experience, I never shy away. Last Sunday was one such ocassion. In the midst of a busy street in Saket, I was thrown back to the memory lane – and the person responsible for this splendid effort was none other than Alobo Naga. As dreamy as it may sound, when I first watched Alobo Naga & Band’s video ‘Painted Dreams’ shot on a terrace with mountains, scattered buildings on the background and five confident Naga guys doing what they knew best, I realised the rising hype around the songwriter was surely justified. I started to observe his rise, the compositions and evolution of Alobo Naga. Alobo continued his musical journey and there was no looking back. The proof of his evolution as a songwriter can be deduced with the topics and the issues that dictated current affairs. After the Delhi gangrape case in 2012, the band released the song ‘Let Her Live’ to remind men of the horrors that women face in this unfair system. The band composed another song to inculcate hope in young people titled 'All We Have Is Now' that highlights socio-political scenario of the country at large, how money and connections work better than talent and Alobo Naga would also consider him a victim of such bias. Apart from being a leader of his band, Alobo also chooses to perform music through his solo project. Songs like ‘Chasing Ghost’, ‘Laughter and Tears’ are a result of that decision. “With the band, the genre is mostly pop-rock and the solo project also lets me explore further the folk sounds to which people can groove”,says Naga. Naga gradually joined the exclusive league of established faces and voices that not only represented the North-east in possibly the most humble manners but invited the rest of the country to collaborate with the region. Alobo recently bagged three awards at the Artist Aloud music awards. (Naga won the most awards in 2018 at the Artist Aloud Music Awards). He won Best song for 'Chasing Ghosts', Best English Song for 'WOLO' and also won the Best Artiste from Northeast India. That was not the only time when Alobo Naga received critical recognition. 'Painted Dreams' was selected as the Theme Song for the prestigious International Short Film Festival 2011 held in Guwahati. The song also went up to No.4 at the International Top 10 chart on VH1 and was successively announced as one of the top 50 videos of 2011 by the same music channel. They were nominated for MTV Europe Music Awards 2012 nominations for Best Worldwide Act and won the Best Indian Act award. Alobo is always known for his mainstream rock appeal but he's venturing into new styles and genres to stay in the competition. He emphasises, "Music is art and what’s the point of that art which people can’t relate to.” His new album ‘Kini’ put the songwriter in experimental mode with different genres and sounds, especially electro-pop has dominated the album. 'Kini', his latest studio effort, arrives six years after the last one. In 2018, how easier has it become for bands to arrive from a small town like Dimapur and make noise as you did back in 2011? "World has become really small because of the internet. Anything and everything is easily accessible. One can record anything and people will get to listen to it. That’s the major difference. Having said that, to make an impact first of all, one needs to come up with good material; no matter if you are active on social media or have a great following. If you don’t have good production, it won’t work. Number one, one should have a good commodity. Secondly, it’s about promotion. I believe 50% is the music and remaining 50% is your PR & marketing. Also advantages like - being from a small town in a city like Nagaland, it is easier to reach out to people compared to Delhi. Even access to media in Nagaland is easier comparatively. But back in 2011, it was more of word-of-mouth and good music. No doubt there were other good bands as well in the scene but there was hardly any band who was making music videos and trying to take another step. On the other hand, we came up with a music video for our single ‘Painted Dreams’ which became an instant hit in 2011. There were only 4-5 bands whose videos used to come at that time. We were not competing with Indian bands any longer, the song had reached International Top Ten amongst the pop artists like Lady Gaga, Maroon 5 etc. So, I can say the genre also worked well for me." So, musicians are still doing something wrong or falling short, you believe? "The problem what I feel with most of the Indian artists today, is that they make music for themselves. They make music they like, they play and they sing what they love and what they believe in, but at the end of the day you also need to understand what the audience wants. They don’t need complicated stuff; if you look at all the hit songs right now, say 'All Of Me', look at the meaning - "all of me loves all of you". It’s so simple. But then again from an artist's perspective, creating something simple but beautiful is difficult. Unfortunately, this is what usually works with the audiences nowadays. There are bands who are trying to put all the technical stuff, lyrically, too, they are writing poetic material that people don’t even understand, although I am a musician so I know how good the content is, but people? They don't care. I feel that kind of music can garner maybe only 20% of the audience but 80% only cares about good melody, good beat, simple lyrics, so that they can sing along and dance. So, in my recent album ‘Kini’, most of the songs belong to the same nature and it’s working. So, I think song selection also matters a lot. Why is Bollywood working? It’s because majority of people can relate and connect to that kind of music. Music is an art, so if people can’t relate to your art, what’s the point then. So independent musicians also need to think that way. In album Kini, I don’t only have songs which people can dance on, but there are songs like 'Poisa' (featuring Borkung and Big Deal) and 'Mistery Gaana' feat Moto that focus on social awareness. My idea is to share my musical art in a manner that everyone can relate and trust me that really works." How is the response to your live performances in other cities compared to your hometown or neighbouring cities? "Fortunately, I enjoy a lot of support outside my hometown as well. Be it any region in Northeast - Shillong, Manipur etc. Initially, it was majorly from only the northeast community. When I travel to places like Delhi, Mumbai, Bangalore etc., northeast community majorly comes out to support me. So, my priority after two three years, post first release was to reach out to more audience and traverse beyond northeast where people already know me. And it has started happening already. Perhaps, it mostly started coming up post 'BreakFree Tour' project. Now, I also get support from places likes Goa, Pune, Mumbai, Delhi, Kuwait, Hong Kong Singapore etc." Starting from gospel songs to exploring new genres, what has been your personal favourite genre? What do you think is working for you? "Gospel songs was never a professional project or anything. I began singing in the church as a kid, and even now, I will visit church and sing songs. Pop music, however, is something I have been doing from the beginning - professionally. I have two projects: one is the solo act and Alobo Naga & Band project. In solo effort, I also cover hip hop/ pop apart from folk sounds whereas the band is purely pop rock. Pop rock music works really well for us. The band is gearing up for an electro pop album release towards the end of the year." Tell us about your international tours? What was the first international tour as an artist and how did you get that opportunity? "Singapore, in 2011. It was through one of our friends in Nagaland who shared our ‘Painted dreams’ song to a promoter in Singapore, they liked it and they called us and we performed, as random as it may sound." There's an obvious emphasis on social and political commentary in your album. How did that happen? "Being musician is one thing, but you can also call me a philanthropist. I love to help and believe in giving back to the society. So, I spread awareness - I have followers and I have a voice. I utilise that to educate people about the cleanliness, importance of education etc. The single named 'Achipiu Mlahnni' featuring Moto speaks about ‘doing it right’. Basically, the idea was simple - to remind politicians to do their jobs in the rural areas. The song speaks about the poor roads, electricity issues etc. and the problems that haunt us daily. The song was released a month prior to the social awareness campaign. It was a two weeks campaign across Nagaland. Within a month people knew the lyrics, people were singing along during our social awareness campaign before elections. Another song 'Poisa' from the album revolves around elections. It’s about educating people to not sell their votes but choose wisely." "I was appointed as a brand ambassador for the Swacch Bharat Abhiyan for Nagaland by the Governor in 2015. I have also done SVEEP Campaign concert all over the 11 districts of Nagaland, spreading awareness through music in the Lok Sabha election 2014. Other contributions are: Sponsoring 17 orphans to school for academic year of 2015 from Bright morning star children Home, Kohima. Raised money for Manipur Earthquake victims 2016, Nepal Earthquake victims, raised fund & operated 10 children with clef palate at Mon district, Poor patient fund, Mokokchung Hospital, Children with cancer, Kohima Naga Hospital, churches, raised funds for the education of children at the refugee camp affected by Rengma-Karbi conflict and many more." What are you doing to uplift the local music scenario in the Northeast? "I do a workshop every year named 'Out Of The Box'. We cover different topics for local musicians like: How to sell your music, Do’s & Don’ts on the stage, online marketing, how to acquire more gigs, how to approach the promoters etc. We bring sound engineers, they talk about ABCs of soundcheck. We get music professionals in our workshops. Last year we got CEO of Hungama music. I myself give stage appearance tips. I have already done two editions, we are doing the third edition this year. We have seen a very nice response to the workshop so far. People across northeast participate in these workshops. Apart from this I also keep doing small workshop, last month I did a songwriting workshop with a professional song writer from Hyderabad named Allen Ganta. So, I use all my connections to support local musicians from Northeast. We are also making music with some local artists from Nagaland." How’s Kini album response been so far? "First, I will tell you why the name ‘Kini’. Kini in Sema (Nagamese) dialect means number ‘2’, like ‘dos’ in Spanish. Kini is my second album, hence ‘Kini’. I am also promoting Nagamese through my album names. We launched Kini in Hard Rock Café, Worli in the presence of Kailash Kher & Uday Benegal last year September. I didn’t release CD, it’s just pen drive and online. I have done gigs across different countries- Bangladesh, Kuwait, Singapore, Hong Kong and the response has been really great so far. I have just started the first phase of the tour in India which will end on first week of May. 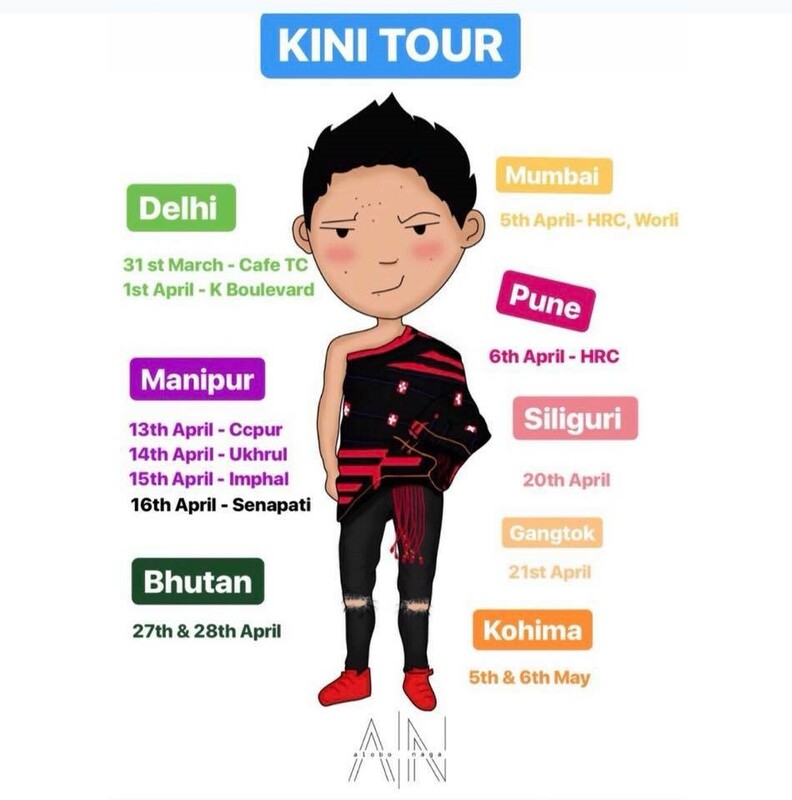 The tour kicked off from Delhi, here’s the schedule- 31st March Turquoise Cottage, 1st April- K Boulevard and then 5th April, HRC Worli, 6th April, HRC, Pune, 13th April-16th April in Manipur (Ccpur, Ukhrul, Imphal, Senapati respectively, 20th April Siliguri, 21st April Gangtok, 28th & 29th April in Bhutan and lastly in Kohima on 5th & 6th of May. We will start our second phase." Each song in your album has different essence to it. Be it Wolo to Mistery to Poisa ft. Moto. What song has got the best response so far? "Personally, I like 'Last Train'. I broke up when I wrote that song. 'Wolo' for some reason is clicking really well. It's a Naga folk song, an old chant saying 'Goodbye my lover'. Overall, the entire album is a relationship story. First song 'A Song for Aiko' is a proposal song (inspired from a famous folk tale), second song is about commitment, called 'Never Let You Go'. The following song 'Wolo' covers the fights and the ego clashes in a relationship, and then comes the 'heartbreak song', titled 'Chasing Ghosts'. The album's final three tracks pushes the lyrical aspects towards post-break up phases." "We are working on our next EP. We are expecting to launch it by winter 2018. I have composed around 16 to 18 songs for Kini and picked only 12 songs, so I will be releasing those songs along with few other songs also in 2018."